My first taste of backpacking was a good six years ago, when budget airlines were still cheap, and didn’t have to book a year in advance to score a good deal. Looking back, six years is a pretty long time ago, longer than my stay at university, and almost as long as I’ve been working. Anyway, any budding young traveler living on this side of the world went to the path of least resistance – if resistance was time and money – and go around South East Asia on a shoestring budget. I remember that trip clearly, (most of it, the blurry parts included a beach and a full moon); it started with a Coldplay concert, and ended with beaches. For this blog post, I’ll stick to the Cambodia leg, where I dropped in Siam Reap to visit Angelina Jolie. No, the movie shooting was done three years before I got in the Angkor Wat complex, oh well. 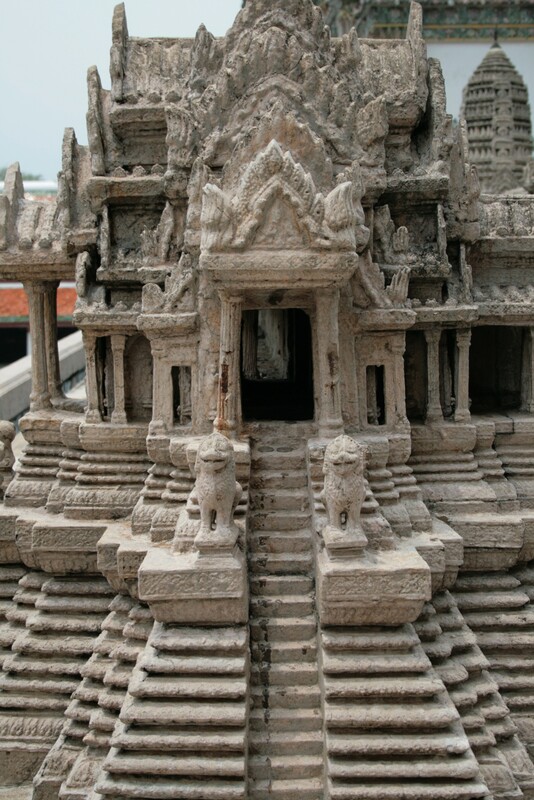 Besides, when I got into Ta Prohm, it was being over run by 8 buses of Japanese tourists and another 6 buses of Korean visitors that I felt like I was in a mallwide sale. Warning – the Angkor complex is huge. I’d recommend biking it, but not on the first day. It’s better to let you tuk-tuk driver pick you up at 4am, head on out to sunrise ridge and mill around when the sun is not at its harshest. Pick up the 3-day travel pass for a reasonable visit to the temples, but if you’re keen on travelling slow, there’s a 7-day option for you. Getting a day ticket might be too expensive and too hurried to appreciate the ruins inside. 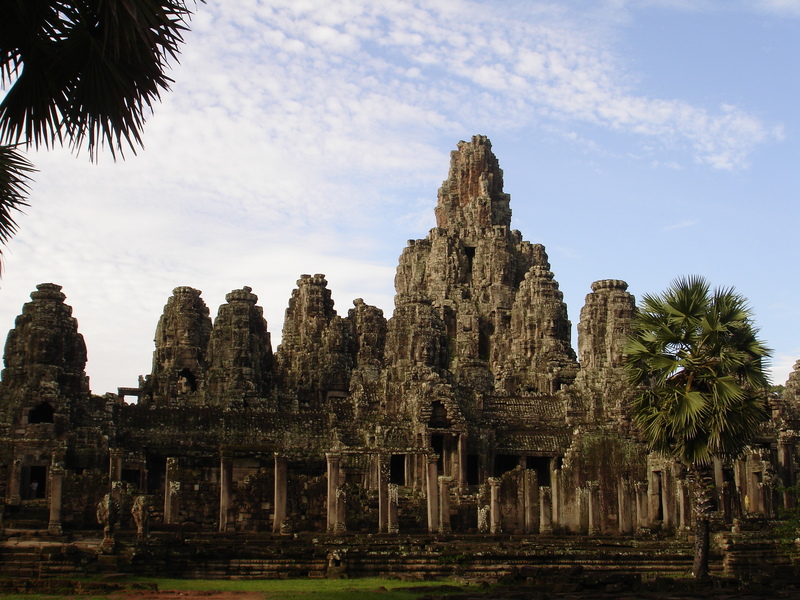 My personal favorite is the Bayon – a temple with numerous faces consistently done with the Khmer architecture style. Wall-to-wall faces are creepy, but the serenity expressed on the stone faces kind of makes up for it. 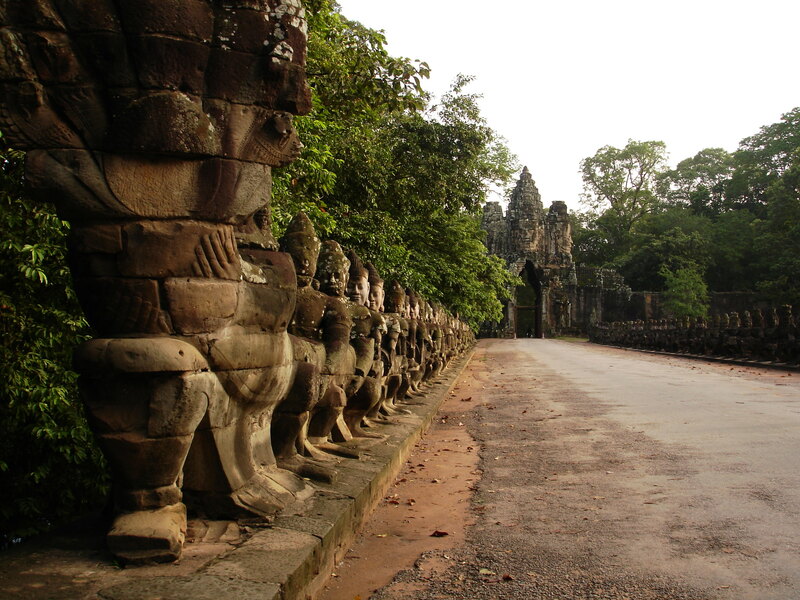 There is of course Angkor Wat – the largest Hindu temple in the world which greets you at the entrance. Careful, the steps are steep heading to the main spire. Not much to say as travel writers have probably over exclaimed their adulation for the temple, including the very famous reflection-upon-the-waters photo. Instead of sharing with you that photo you’ve seen everywhere, here’s a one of its replica within Bangkok’s Wat Phra Kaeo. 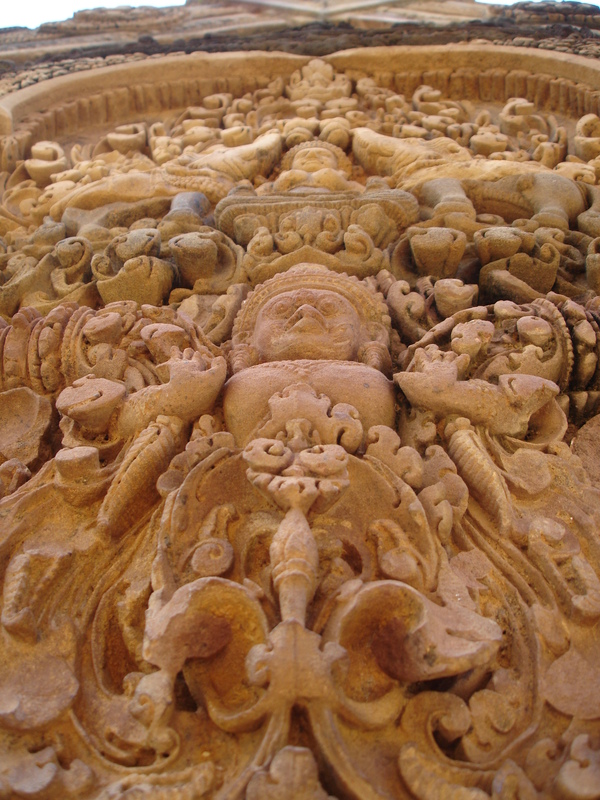 However, if you’ve got a bit of time to explore the adjoining areas, I would like to recommend Banteay Srei – a temple devoted to Shiva. Of note is the reddish hues of the building, and more impressively, the carvings adorning the walls, columns, and balustrades. It’s a good 40 minute ride to the ruins, but well worth the journey. I wrote about the experience in SR in my other, older blog, and it’s funny what I remembered then – Bussing out of Cambodia. My only excuse is that it was six years ago.